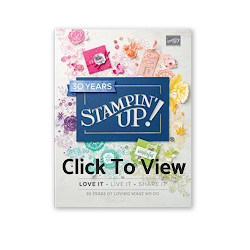 It's time for another Inspire Create Stamping Challenge and this time we have a colour challenge! Aren't they a lovely combination? I love a colour challenge. I don't know if I would have put these colours together but now I have I love them ! 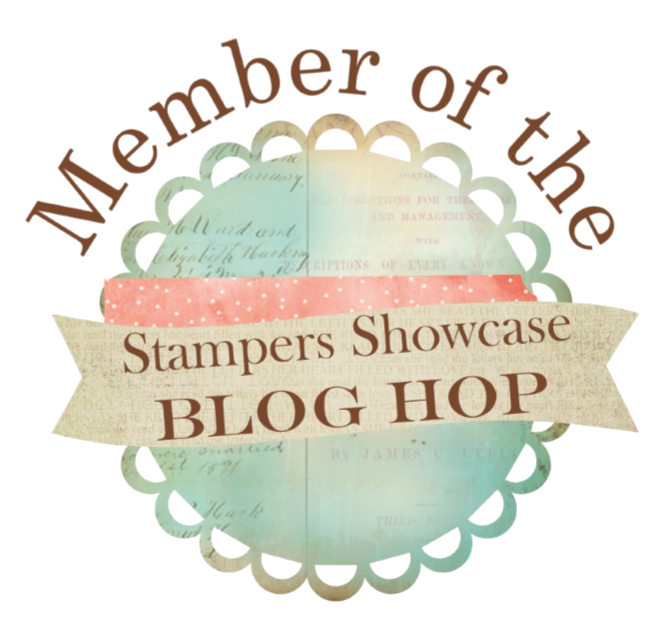 Do pop over to the Inspire Create Stamping Challenges here to see what the rest of the talented Design Team have come up with and all the entries too. Do play along. 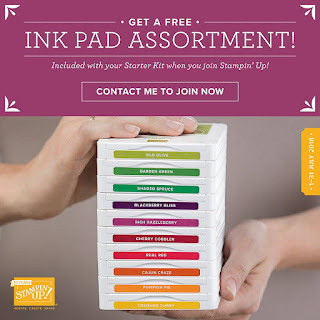 Adding your link is easy, it's fun to take part and we'd love to have you! I have been playing with the Dandelion Wishes stamp set a lot lately. I haven't been able to put it down. I thought it would be perfect for this colour challenge. I wanted to give the impression of the Dandelion clocks blowing away against a summer sky.at sunset. 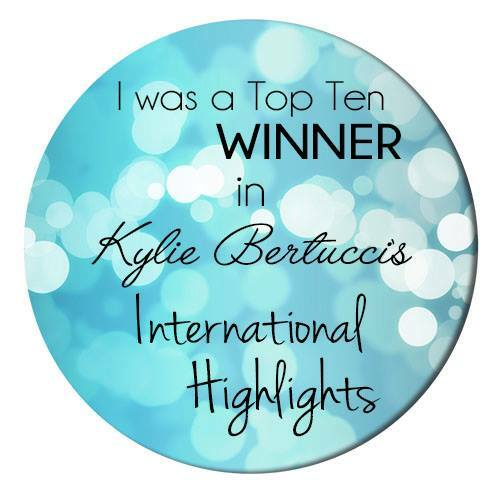 The dandelions are embossed in silver to give a pretty contrast. I wanted a watercolour wash background to give the impression of a summer sky. I used an Aqua Painter (this is a paint brush with a water filled chamber) to lay plenty of water down on a watercolour paper layer. I then picked up the colour from the Coastal Cabana Ink pad with the Aqua Painter and laid it down. I added the ink from the Powder Pink Ink Pad in the same way . I used less of the Powder Pink. My water colour paper is 9.5 cm x 13.8 cm. I have stamped the dandelion clocks in clear Versamark Embossing Ink and then heat embossed with Silver Embossing Powder. I have used the adhesive rhinestones for the centres of the dandelion clocks to add a little sparkle. I have stamped the Sending Well Wishes Your Way onto Whisper White card using Coastal Cabana ink and stamped some of the little clocks in Powder Pink around. I wanted to created a label so I have used the oh so useful Everyday Label punch and raised it on a couple of Dimensionals. I have added some of the new Whisper White Bakers twine between the layers and tied a simple knot along the top. and on the envelope in Coastal Cabana ink. It's always nice to dress up the envelope a little. Here are the products I used to make this card with clickable links to my online shop. 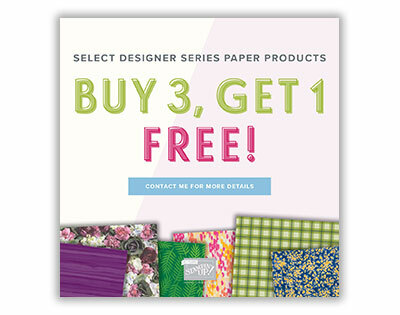 We have a fabulous offer on Designer Series Papers this month! 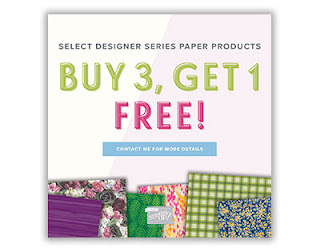 Buy three packs and get a fourth completely free on select packs and there are loads of beautiful papers to choose from. You can see them all here and shop on my online shop.